detectors, 16 remote controllers, 32 wireless intruder detectors. Maximum 8 wired zones. Zone 1 and zone 2 for wired door/window magnetic contact, which will remind you if the door/window is open. Send alarm SMS to 5 preset mobile phone No. 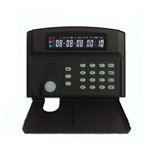 Auto dial 5 preset user phone No. Forward mobile company SMS to user automatically. Work with monitoring center, such as police station. One relay output control DVR/Home appliance remotely. Zone classification prevent inside thieves effectively. 220 wireless address encode reduce the rate of same code greatly. SMS modifies wireless zones name. Call the main unit to listen in status whenever.